The marginalia of illuminated manuscripts is weird. When monks weren't complaining about their jobs as they hand-copied line after line, they were inserting fart jokes into the margins. 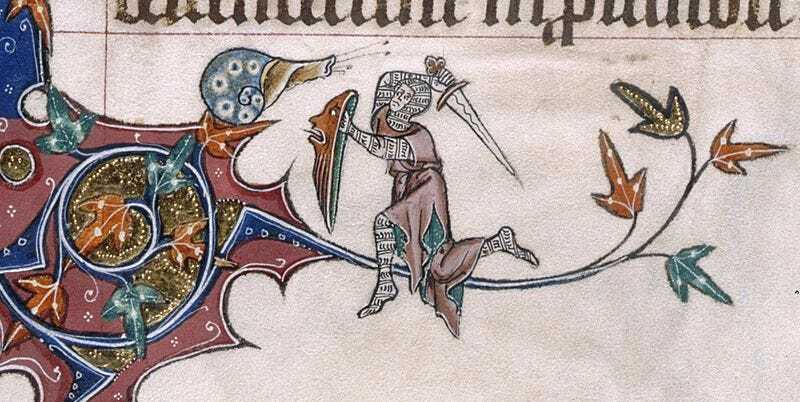 But one weirdly persistent image is of knights battling snails. Why? Who knew illuminated manuscripts contained so many fart and poop jokes? Nor does it stop us from simply enjoying the absurdity of the images. There are more over at the Medieval Manuscripts Blog.